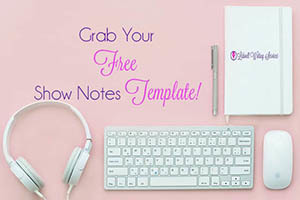 Whether your podcast is newly launched or has been around for a decade - YOU NEED SHOW NOTES. With over 600,000 podcasts hitting iTunes, Stitcher, SoundCloud and other podcast hosting feeds and catchers, this content medium is quickly becoming one of the best resources for businesses and entrepreneurs to promote their products and services, engage with their target audiences, and share their expertise with more people. But - for podcasters - one of the most dreaded parts of producing their great audio content is taking time to handle the post-production tasks, such as writing the show notes and promoting each episode on a variety of media platforms. Why do you need podcast show notes? But our show notes do! More Twitter and Facebook followers? Are you ready to take your show to the next level? I have never had a moments concern about the work you do for us. You always deliver on time, on budget, and to exceptional standards. Service is great, saves me time, and it's affordable. It’s a great start for people just starting out podcasting. It’s affordable but still great quality. A win-win for the beginning podcaster. Y'all do a great job on writing quality in-depth show notes and I like the CTA/quote additions. Turnaround time is fast and the price for varying episode lengths is affordable. Are You Ready to Get More Listeners, More Followers & Drive More Traffic to Your Website?